WANT VIEWS, CONVENIENCE, BEAUTY & COMFORT? YOUR DREAM VACATION STARTS WITH OUR UPGRADED MAUI BANYAN CONDO. We are VERY PROUD of our beautifully designed unit...Newly UPGRADED 6/17. All of our guests LOVE our upgraded beds. The bedroom has a super comfy CAL-KING-I-COMFORT (cool gel) Bed. The living room queen sofa sleeper is Air-Over-Coil Technology - “Air Dream ULTRA." Our newly remodeled and beautiful FULLY EQUIPPED KITCHEN.. The added convenience of our LARGE CAPACITY WASHER & DRYER. We have 2 flat screen TV's, FREE High Speed Internet, 2 A/C units, 2 ceiling fans, and covered parking. We keep our condo beautiful and well equipped. It was professionally designed. (Scroll through the photos and enjoy the beautiful outside views as well as the peacefulness of the interior of our condo.) 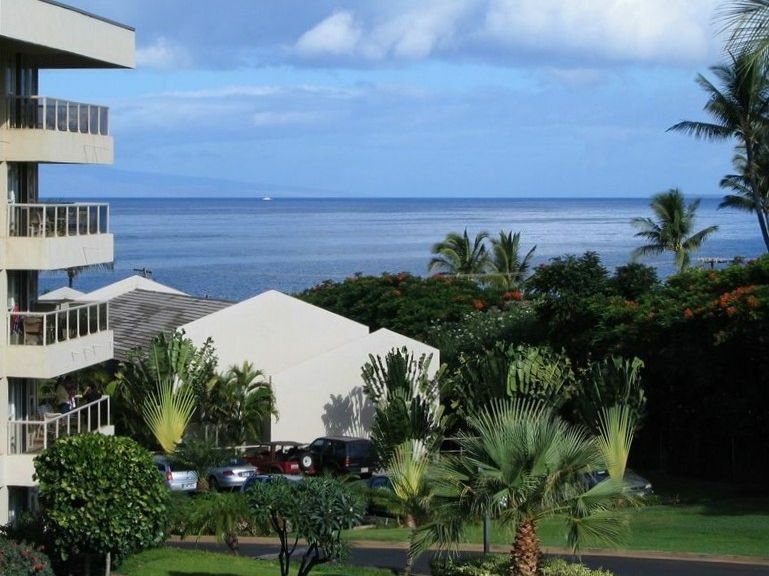 At the Maui Banyan, our units location is sought after because it is in the POPULAR 'H' BUILDING. As such it is only a few minutes walk to the beach, shopping and restaurants, yet it is protected from the Kihei Road noise. The interior of the unit was decorated by a Feng Shui Master and is 'simply beautiful.' It is alive in color and peaceful in nature. I have included a picture of every room in the condo - so you can see it all. And please READ THROUGH the entire listing including traveler's reviews so that you know what we have to offer you. ABOUT OUR CONDO: When you aren't appreciating the fantastic views or the ocean...there is always FREE WIRELESS INTERNET, 2 flat screen TV's (one with DVD), cable premium packages, Truly a bargain, our unit offers facilities to make you feel completely at home away from home. For instance, there is a washer and dryer located in the unit along with a fully equipped kitchen, including a dishwasher and microwave. Of course our unit has air conditioning and two ceiling fans. Our unit is located 4 floors up in the H building and is situated perfectly so we don't hear noise from Kihei Road. Yet I can cross Kihei Road and be on the beach in less than two minutes. Our building is conveniently positioned...you can quickly jump in the ocean, yet it is far enough back from the road and protected by 4 front buildings that stop the traffic noice from reaching us. The units, being all concrete, are very quiet. Maui Banyan is one of the NEWEST CONDOS within minutes of the South Kihei beachs. It boasts two amazing community areas. Both include covered patio/eating area, swimming pools, hot tubs, showers, restrooms, lounge chairs, several Weber BBQ'S. Enjoy the TENNIS COURT and ample COVERED PARKING as well as beautiful tropical landscape. The Maui Banyan is located ACROSS THE STREET from Kamaole Beach and Park II, one of Maui's most noted and BEST WHITE SAND BEACHES. Want another beach? Simply turn left on Kihei Road and enjoy Kamaole III beach which includes a large park with swings, BBQ's and picnic areas. Both beaches are world class, both beaches are an easy and quick walk and both beaches are less than than five minutes away. BOTH BEACHES HAVE INCREDIBLE SUNSETS, SNORKELING AND WHITE SAND. Kamaole beaches have restrooms and a lifeguard and are perfect for sunset picnics, sunning, boogie boarding, swimming, or snorkeling...or just enjoying a view of the sparkling turquoise waters and the tropical islands of Lanai, Kahoolawe, and Molokini. Located in South Kihei, there are many shops and restaurants within walking distance. Within minutes you can even walk to a grocery store (Hawaiian Moons. ), restaurants and shopping. Check our guest comments for more information and our calendar for availability. Holiday and high season rates may apply. Keywords: 1 of S. Kihei's NEWER condos. Our amazing unit is steps from the ocean yet is quiet. Our BEAUTIFUL UNIT has every ammenity & breathtaking VIEWS. Super convenient to everything plus covered parking. An easy walk from our unit gets you to Kamaole Beach Park II in just a couple minutes. If you choose to walk a couple more minutes in the opposite direction, you'll arrive at Kamaole Beach Park III. View the ever changing beauty of the West Maui mountains from inside our condo and the magnificence of Haleakala from our lanai. Kick back on the couch or relax on the lanai to enjoy the beauty of the ocean, the amazing sunsets and maybe even spot a whale. Two new, high end Friedrich, built in air conditioners. The elevator is conveniently located just inside the security doors for our Building "G/H" Entrance. Kitchen has all the conveniences of home. Microwave, coffee maker, britta water filter, toaster, blender, can opener, dishes and cutlery. Two newer high end Samsung televisions. Living room has a new awesome 55” curved 4K smart TV and the flatscreen bedroom TV has DVD capability. High end cable package including HBO and Showtime and others. Two family pool and spa community areas to choose from. Both contain restrooms, covered family eating area and several BBQ's. We are 5 minutes away from an ocean activities launch ramp which offers EVERYTHING from awesome scuba & skin diving, adventurous snorkeling and fishing trips to sunset cruises. Also close are phenomenal Helicopter tours. Fun in the Sun, Boogie Board, Surf, Stand Up Paddle Board, and you can snorkel and see turtles right off of our beach across the street....only a 2 minute walk.